[Detail views: Handcrafted chintz from RedTree Textile Studio. 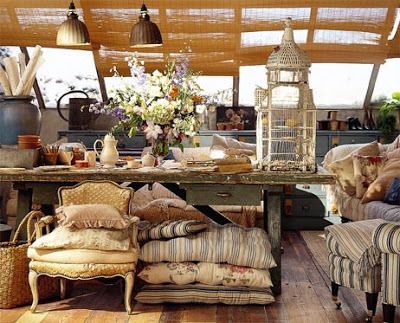 Chintz. 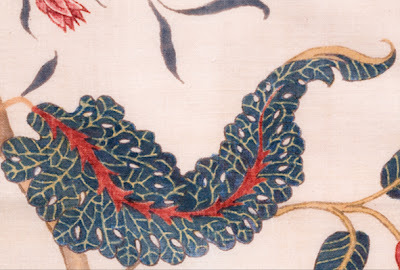 Today the word suggests a tame, flower-filled realm. 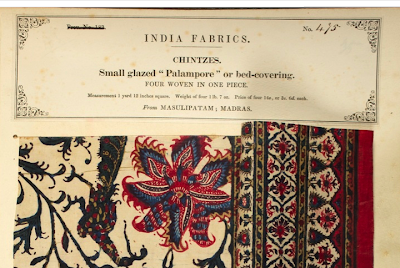 But there was a time when chintz -- hand-drawn, resist-dyed cotton crafted in India specifically for the West -- was a political hot button. 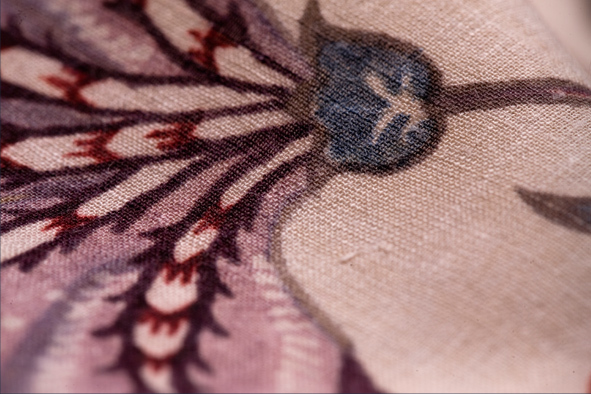 It incited riots and drove British women to buy fabric on the black market. 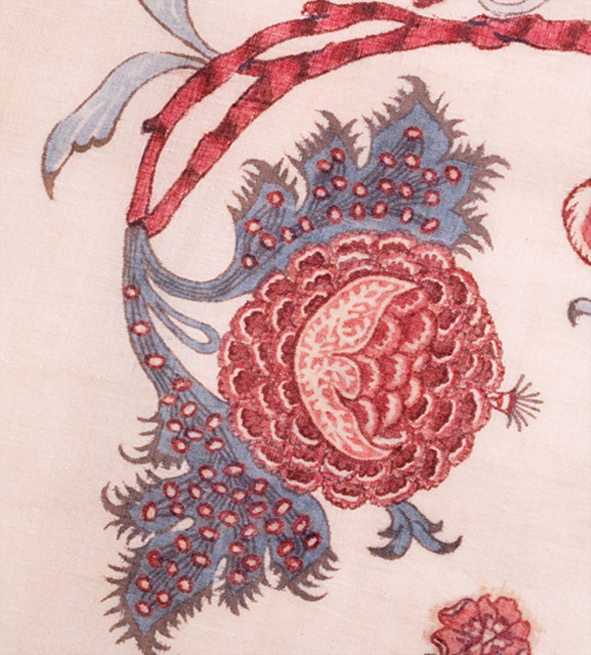 Some even say imported chintz was the spark that ignited the Industrial Revolution in Europe. In her chintz podcast, Rosemary Crill explains that the word is actually an Anglicization of a Dutch form of an Indian term meaning "sprinkle" or "spatter." Confusing because the finely drawn patterns seem nothing like spatterware. (Although, Crill says, some chintz does have "sprinkled" color in the background.) 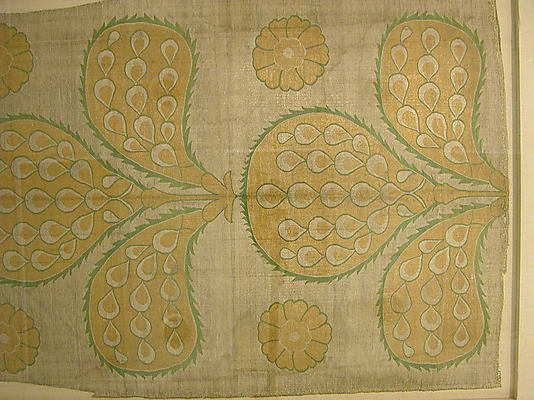 Moving past etymology, what's really fascinating about this cloth is how its style endures. Renuka Reddy is among the 21st century devotees. 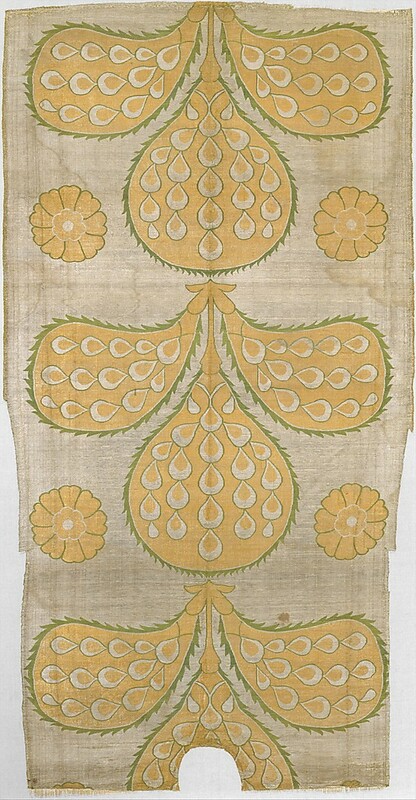 At her studio, RedTree, she continues to research antique examples and use old world techniques to produce new fabrics. Pictured here are her non-commercial trials based on pieces in the V & A's collection. 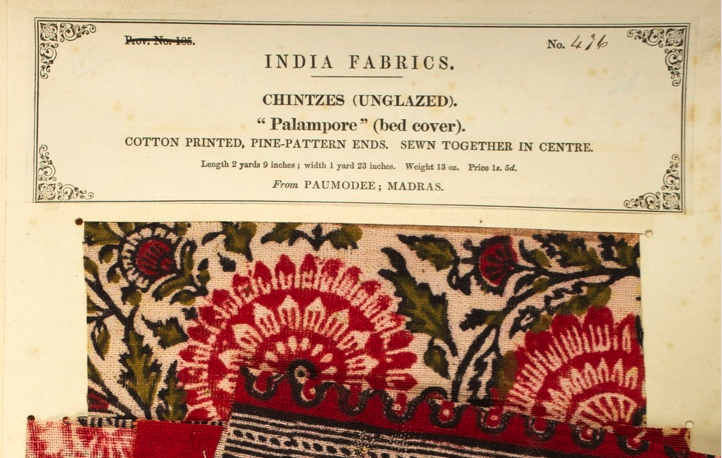 Reddy is after chintz as it existed in the 17th and 18th centuries. She likes to see the fine white lines that make old chintz distinctive. Because her studio uses intricate resist-dyeing techniques, in addition to hand-painting with a kalem on hand-spun and hand-woven cotton, she told me that she believes what she is doing is unique. 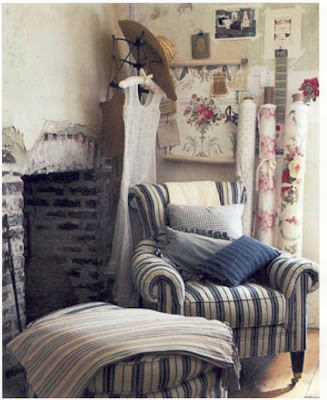 RedTree also accepts commissions from designers to create limited yardage of original designs. So you can contact Reddy if you're interested in learning more. Below, let's look back at the ancestors. Calico Museum installation: India's trade cloth. 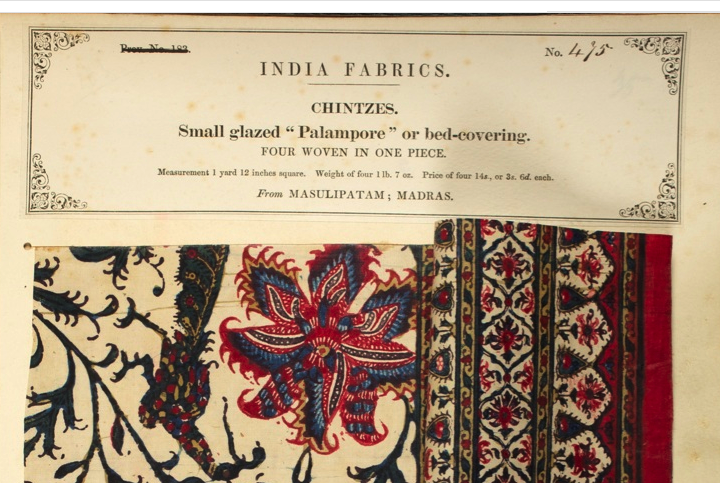 And chintz documented in John Forbes Watson's 18-volume, 19th-century sample set, The Textile Manufactures of India. Lastly, some of the beauties included in Crill's illustrated talk, such as the pink ground cloth favored by the Dutch and a Chinese/English/Indian hybrid. A good thing just got better. For years I've sung the praises of Louisiana-based designer and textile collector Rebecca Vizard's mini Christmas stockings. 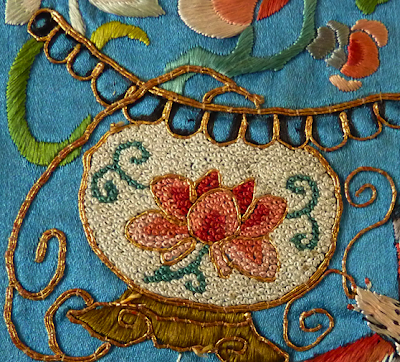 Using fragments of vintage and antique suzanis, Fortuny, and other trims and textiles, seamstresses in St. Joseph handstitch the stockings based on Rebecca's designs. I typically hide clues in mine, as part of annual holiday game, but they can hold all sorts of things. Most people probably use them simply as gorgeous ornaments on the tree. But now there's no need to wait until the holidays. Rebecca has created versatile 4" x 4.5" suzani pouches to bring out throughout the year. Think Thanksgiving dinner (a pouch at each person's plate), birthdays, showers, gift wrap...well, you get the idea. I've been taking advantage of MetPublications, a new online feature that gives visitors free access to the Museum's books and journals -- roughly 650 titles so far. Many out-of-print catalogues can be read cover to cover while other books are available in preview form. Orientalism: Visions of the East in Western Dress, a Met catalogue from 1994, grabbed my attention first. 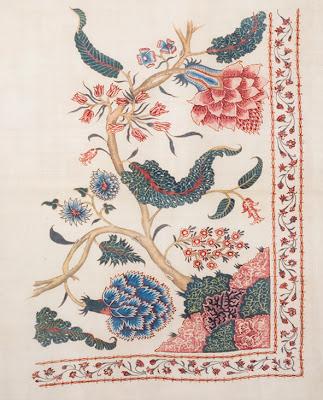 In the chapter on India, Harold Koda and Richard Martin describe how Europeans snaked the boteh motif (aka paisley). Embraced it so tightly, in fact, that by the 20th century the pattern was perceived as an iconic British menswear look. I'm definitely partial to the menswear interpretations, too. 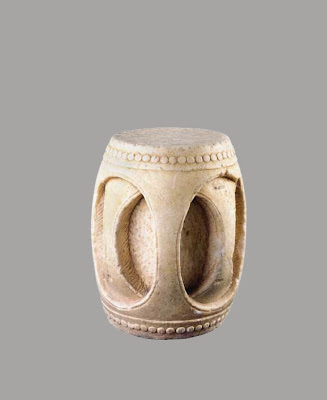 But searching through The Met's collections, I found some ultra-feminine examples not included in the book. 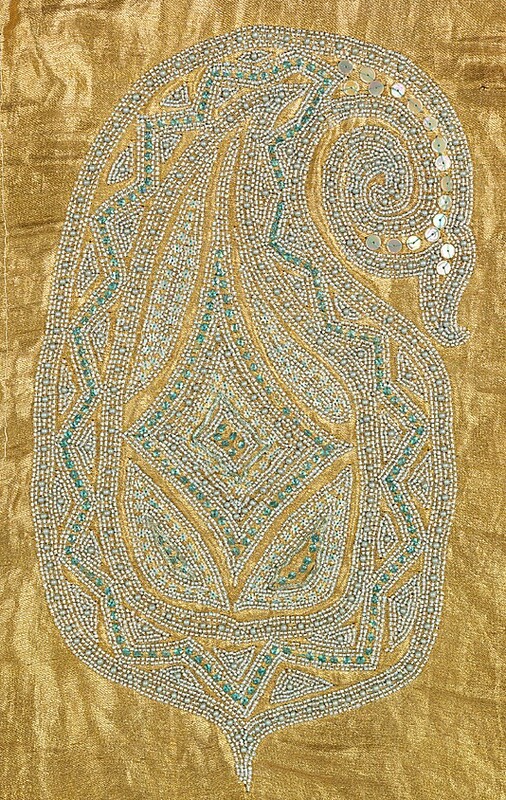 Above is Sarah Lipska's beaded and embroidered, vaguely modernist take on a boteh from the 1920s. 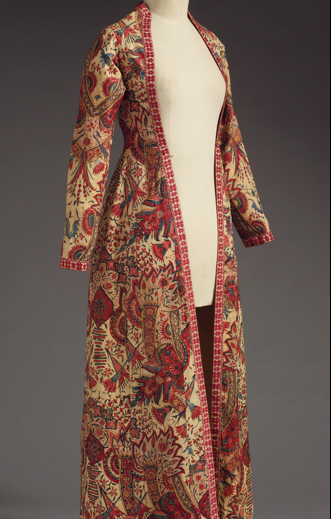 According to the Museum, Lipska once worked with Ballets Russes set and costume designer, Leon Bakst. 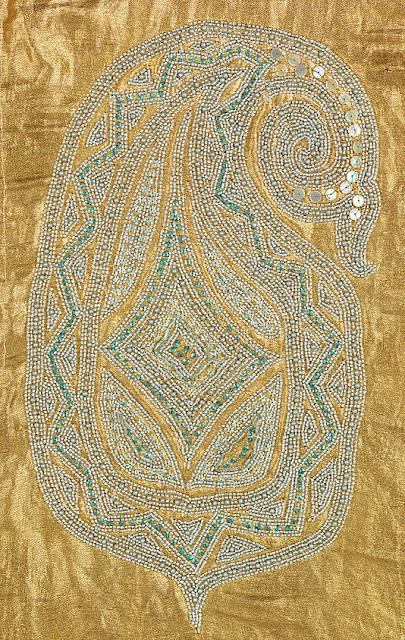 This piece, along with a silk metallic boteh-covered bag by Lanvin, typifies the Roaring Twenties vogue for all things "exotic." BTW, a few great Ralph Lauren pieces from the 90s are included in Orientalism's chapters on Southeast Asia and the Near East. Not to propagate gender stereotypes, but in school I was a real math-a-phobe. Except in geometry class. Geometry I didn't dislike, and if my text books had been illustrated with Mughal-style jalis, I might have seriously embraced the subject. 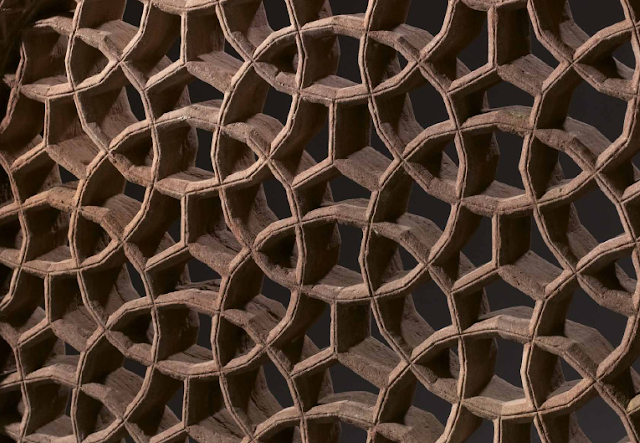 With their symmetrically interlocking circles, squares, hexagons, octagons, and eight-pointed stars filtering the sun's rays, carved jalis have great allure. If you've been inspired by the pierced jalis Doris Duke commissioned in the 1930s, or maybe by the patterns in Matisse's collection of North African haitis, you'll want to see Francesca Galloway's new exhibition, Red Stone, on view through November 9. Although the show is in London, Galloway has published a beautifully illustrated 65-page catalogue devoted entirely to these perforated screens. George Mitchell contributes text. 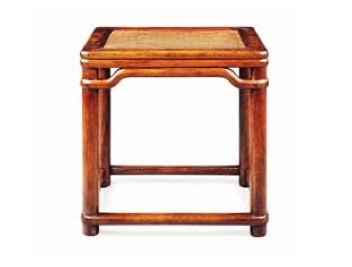 The featured jalis come from a private English collection, previously located in a Someret country house. 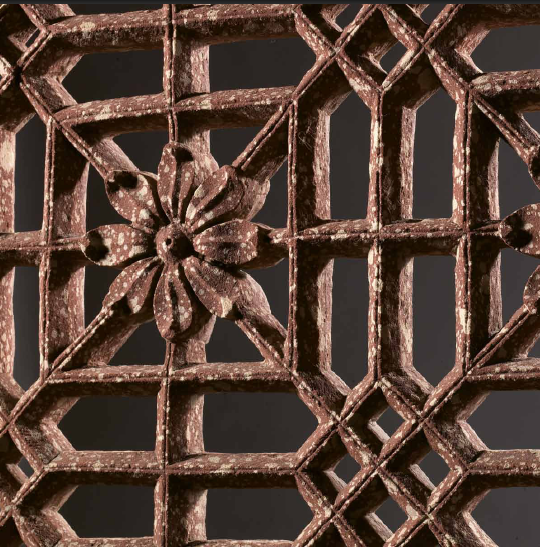 Mitchell writes that while architectural screens are certainly found elsewhere throughout art history, Mughal Indian artisans crafted unparalleled perforated stone examples with "kaleidoscopic patterns." 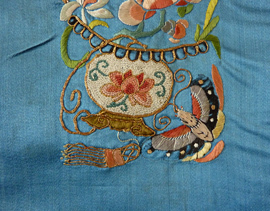 While you're visiting Galloway's site, don't forget her spectacular textile collection. 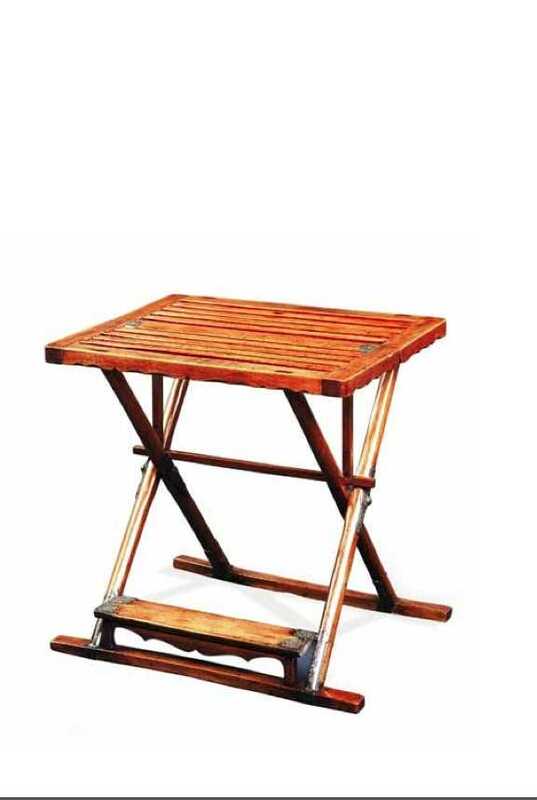 In my experience, it's rare to encounter someone who can't appreciate a Ming chair or stool. 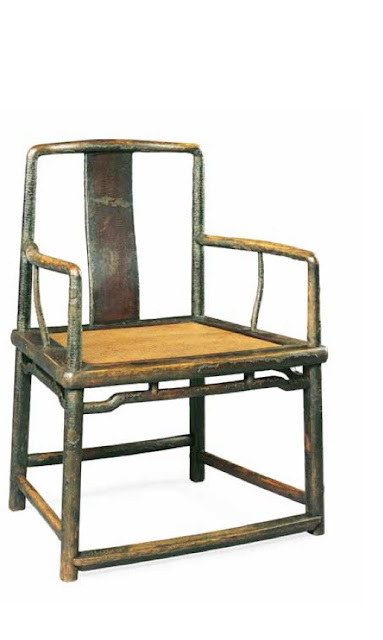 The sculptural, iconic forms just elicit a positive response. Classic Chinese pieces are to a room what an old black cashmere sweater and beloved pair of jeans are to a wardrobe: endlessly versatile. 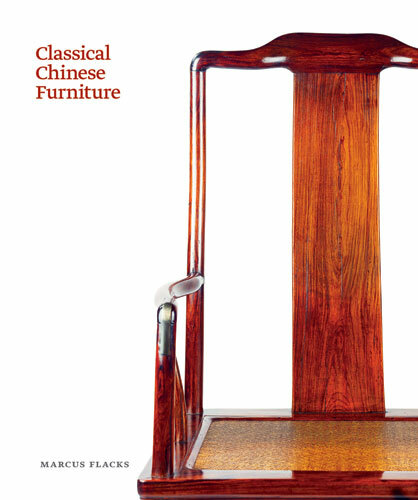 With his new book, Classical Chinese Furniture, antiquarian Marcus Flacks helps us understand what we find so alluring. 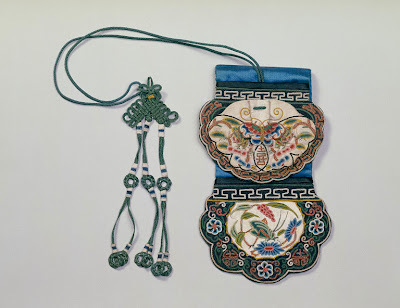 From the very beginning of his generously-sized volume, Flacks is quick to acknowledge books that have come before: seminal books like Wang Shixiang's Connoisseurship of Chinese Furniture that are encyclopedic in scope and answer pretty much any question one might ever have regarding a Ming or Qing table or chair. 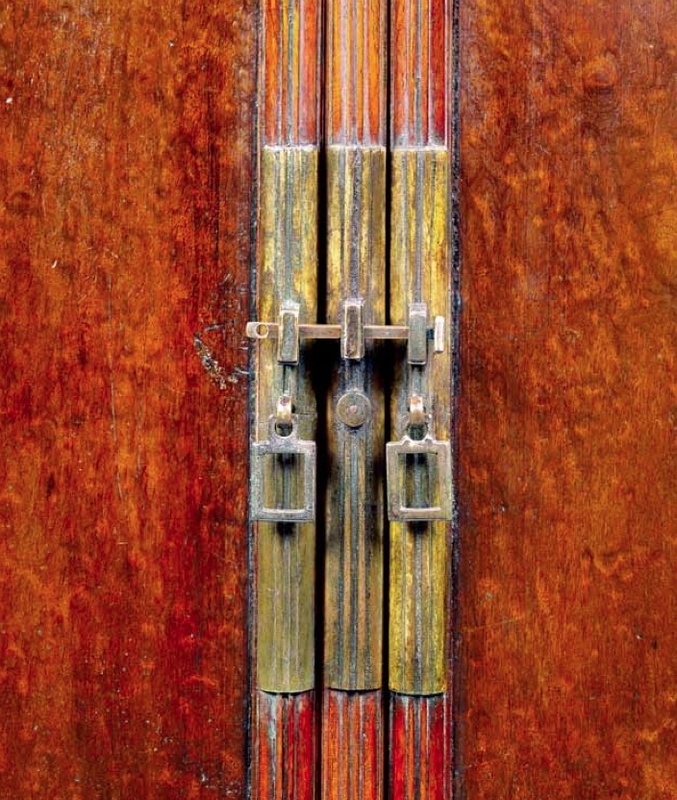 In contrast, Flacks describes his own tome as essentially a survey of the most extraordinary pieces he's handled or seen over the past three decades -- a record of his personal passions. But that said, his book is also a really valuable resource. Much like the clean-lined furniture he loves, the book's format is straightforward. Starting with the Han dynasty, he offers a brief tour through the history of Chinese furniture, covering form and function, and explains why the "golden age," in terms of design and craftsmanship, is thought to extend from the Ming to Qing dynasties (late 16th through early 18th centuries). 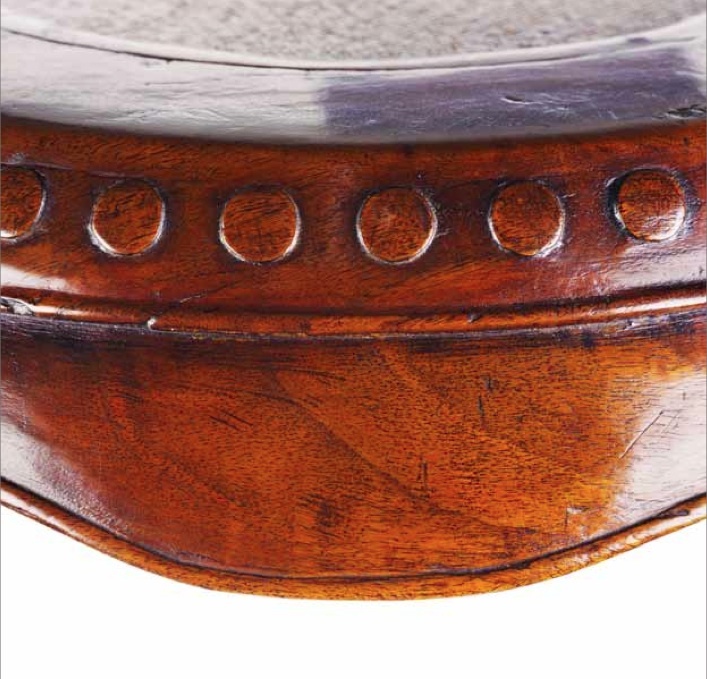 Changing tastes, recent trends in collecting, pairs vs. singles, and decisions about whether or not (or how much) to clean certain pieces are other subjects he explores, then it's on to the book's core: wonderfully large-scale images of 52 standout antiques, each accompanied by concise commentary. Just don't skip too quickly through the reference section at the back; it's brimming with detailed images of wood grains, furniture in various stages of restoration, joinery, size comparisons and materials. If richly lacquered Chinese furniture is your obsession, know that Flacks opts not to explore it in depth, explaining that his area of expertise involves simpler hardwood pieces finished with thin translucent lacquers that allow natural grains to glow through (this more organic look was typically favored by Chinese scholars). But he does delve into highly decorative surface pattern on stone. 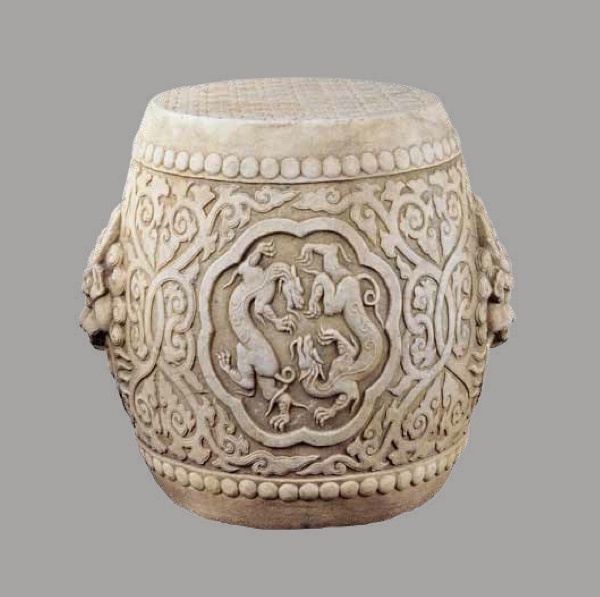 The intricately carved white marble stools and table are a revelation. 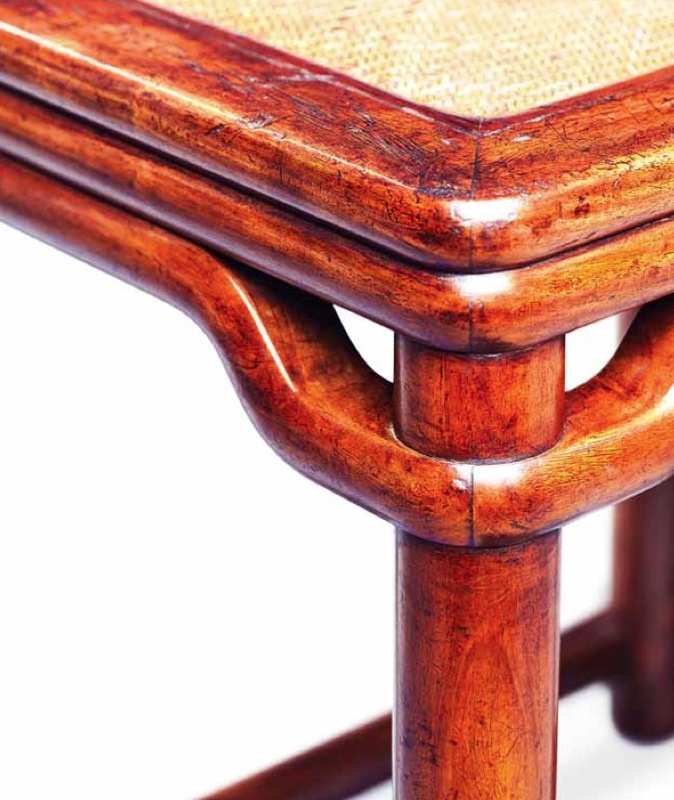 Although Chinese stone furniture is less familiar -- perhaps less desirable -- to many collectors, it's a category the author is keen to spotlight. 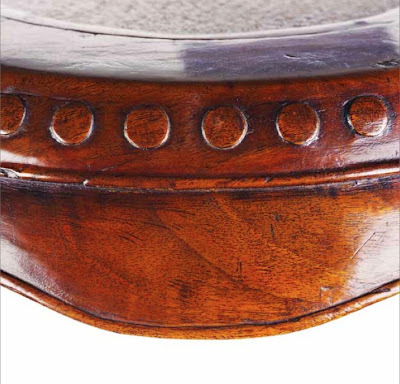 The 17th-century drum stool, above, was carved by a craftsman with great precision and a sharp sense of balance. 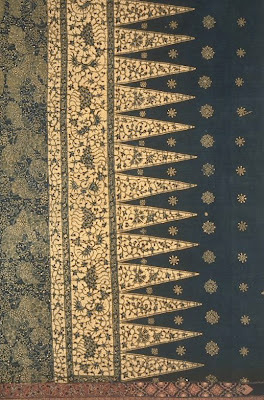 Compare the all-over pattern to a Kangxi brocade. 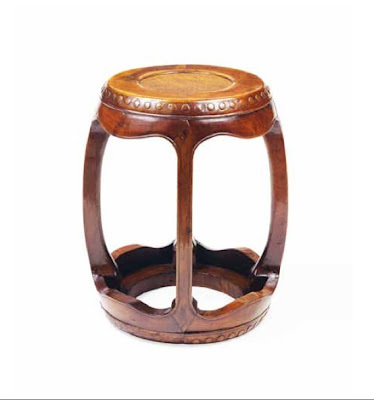 The 17th-century huanghuali wood stool, shown second from the top, has unexpected straight low stretchers and round legs. The open walnut drum stool, also 17th century and seventh from the top, has remarkably slender and graceful legs, carved bosses (the rows of circles) very close to the top and bottom, and a soft caned seat. The Ming folding stool, ninth image from the top, has a slatted top instead of a woven seat as well as restrained metalwork with silver inlay, and it is one of only four (with the same form) known to exist. 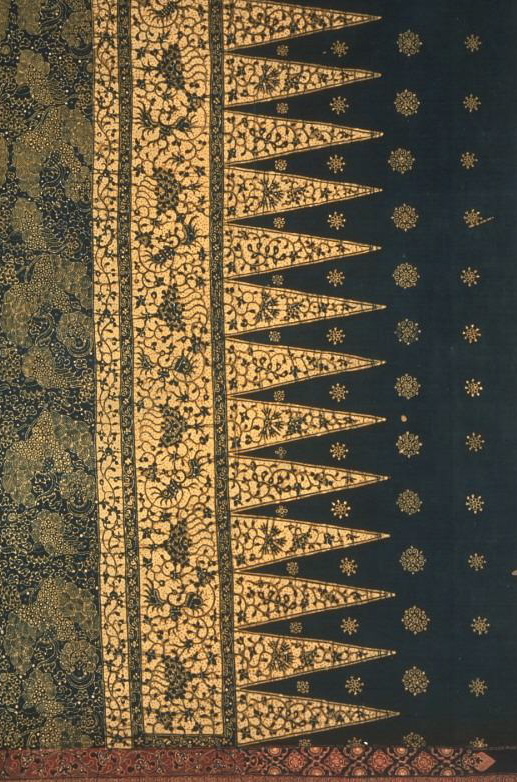 For a jaunt to Southeast Asia, see Duke All Around. This 16th-century kemha (or lampas-woven silk) fragment is from The Met, not the V & A, but it makes me think of something that the British designer Arthur Silver might have reproduced for his Victorian Silvern Series (a compilation of South Kensington textiles intended to inspire his clients, including Liberty of London). 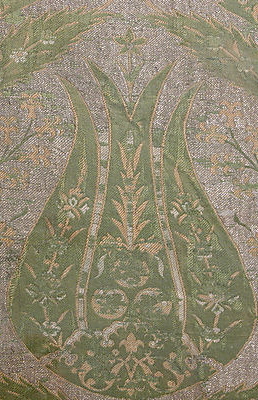 It's Turkish with metallic wrapped threads, and more complete views can be seen here. Marcus Flacks' book, Classical Chinese Furniture, opened to an incredible carved white marble 17th-century drum stool. Soon I'll share the full view of the piece, along with a look at the entire book, but I wanted to leave you with this teaser. Flacks compares the design on top to a brocaded textile. It's one of many timeless. yet rather less predictable, seats covered in his new reference tome. Stay tuned for more. 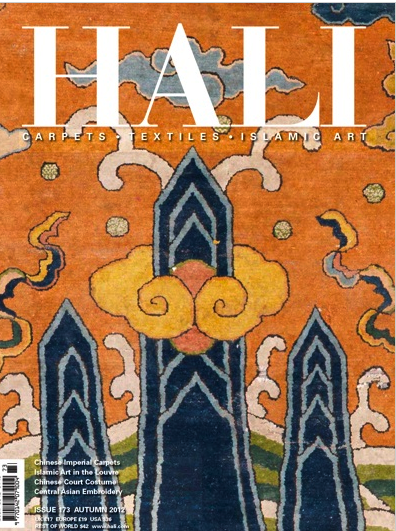 Last week, in my rush to help spread the word about Monique Lévi-Strauss' latest book, I neglected to mention that Hali's entire fall 2012 issue is a must see. 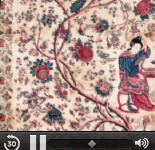 Especially for fans of Chinese textiles. 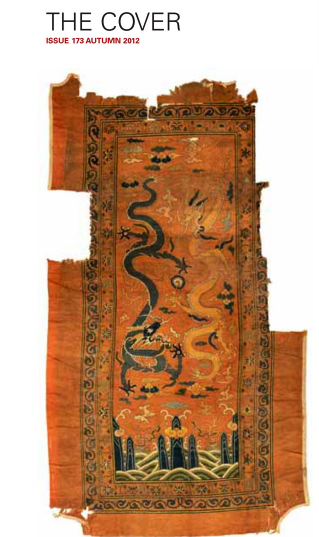 The star that made the cover is this 16th-century late-Ming Imperial two-dragon carpet. It's scale is palatial -- nearly 35 feet by 20 feet -- and, according to Michael Franses, echoes the design of the monumental carved stone pathways along the Imperial Way. 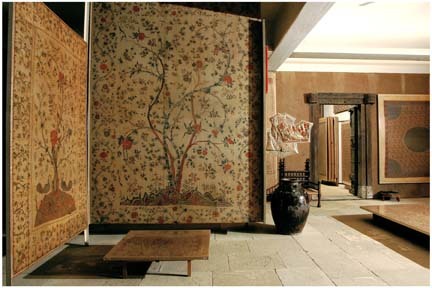 There are several related articles in the magazine, offering extensive coverage of Chinese rugs and court robes. 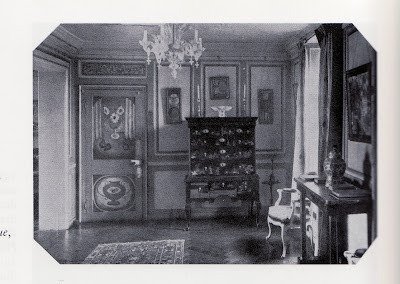 There's also a peek inside the Blue Drawing Room at Wildenfels Castle. 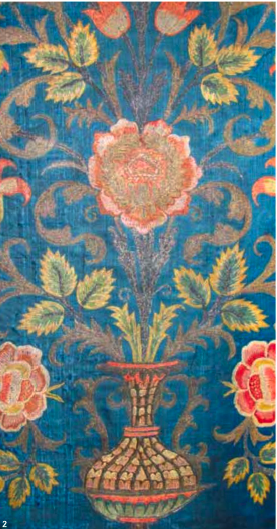 Used only for celebrations, reports Christian Erber, the room is lined not with German wallpaper or Western European fabric but metallic-thread-embroidered silk Ottoman panels that were likely acquired in the 1740s. 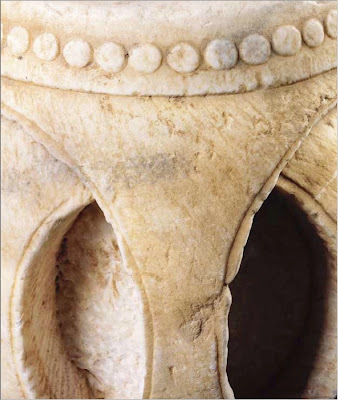 The detail, above, shows iconic Turkish tulips and roses spilling out of rounded vases. 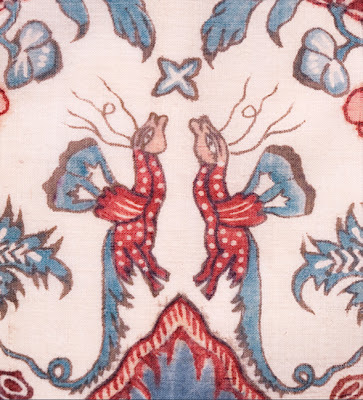 To see the whole installation, and learn about textile conservator Roxana Naumann's restoration, check out the new issue. Are you watching the new season of Upstairs Downstairs on Masterpiece? If so, then you've probably noticed the beautiful Ralph Lauren spots (shot by Carter Berg) at the beginning and end of each Sunday night episode. RL seems to be a natural fit as corporate sponsor for Masterpiece. 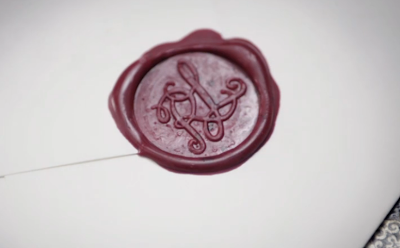 Not just because aspects of the designer's aesthetic are aligned with the look of certain British period dramas. No, he's also something of a storyteller himself; for decades now, through his collections (both fashion and home) and ad campaigns, he has created his own mini narratives. Daniela Kamiliotis -- Ralph's Vice-President of Design for the Women’s Collection, in-house artist and resident muse -- literally inhabits worlds of her own invention. 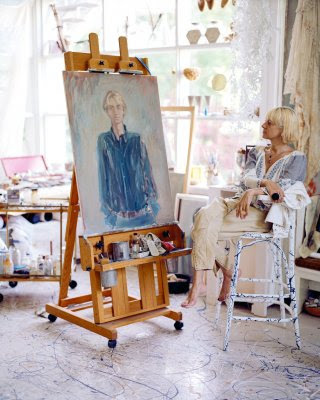 In a sense, she's always done this: "When I was 15, I painted all my furniture and walls in my Bucharest apartment, with the encouragement of my parents and grandmother," she told me. Typically ethereal, her very personal spaces are complete with her own cast of characters. Weeks ago, she sent me some photos of more recent personal projects. Initially, I thought Bloomsbury. Like artists Vanessa Bell and Duncan Grant, Daniela's brush and pen still touch pretty much everything she comes in contact with: the plates she and her husband use daily (she has her own kiln), their walls, textiles, furniture, clothes. But Daniela said it's Jean Cocteau's work that inspires her. 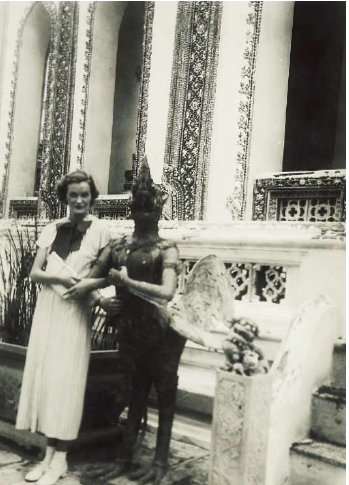 After all, she began in the theater and was a costume designer before joining the Ralph Lauren team, first in the home division and later in women's. 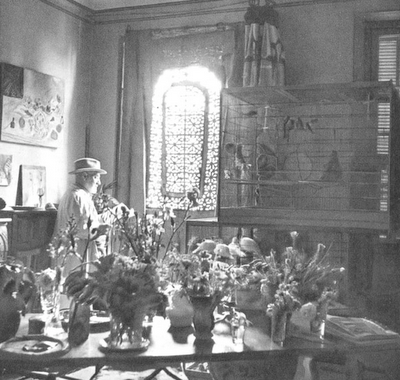 "I have always admired Cocteau as an artist. 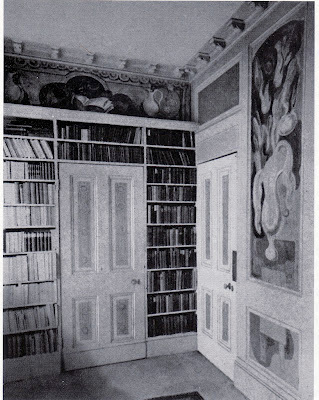 As I do, he embellished his walls -- the rooms he lived in. Because of his sense of humor and whimsy, I feel very close to him. I even painted our terrace [out in Connecticut] with his characters," she shared via email. 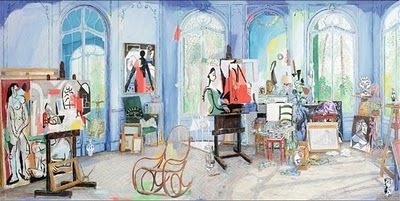 Those other 20th century giants Matisse and Picasso inspire her too. Since she and her husband like to entertain (real celebrations with lots of dancing in Daniela's Connecticut garden), she couldn't resist painting Matisse's Dance (1) on an exterior wall where it serves as a backdrop for the festivities. Also a precursor to a big celebration was her homage to Picasso. She focused on his pieces that relate to women and dreams, as well as the artist's studio, because these themes run through her own work. Understanding that her studio outside the city is such a personal retreat, I asked Daniela how she separates the art she does just for herself from her work in fashion. Or if she even tries to. "I do try to keep my work in the studio separate. Although, so many ideas come from that place, where I am with my thoughts alone. 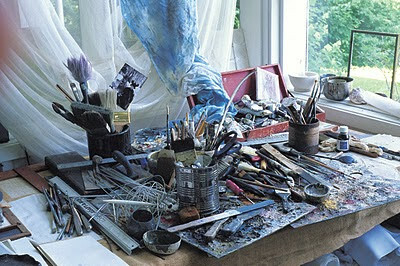 My job [at Ralph Lauren] is to give inspiration -- use all my skills as a painter, designer and artist. There is no way not to give a big chunk of my soul there. My dilemma is what part is for me and what part is the one I choose to give." Mary Laura Philpott, an extremely bright and gifted friend, clued me in to the "world of our own invention" line in Bright Star. I was too busy soaking up Jane Campion's general aesthetic and details like Susan Cowie's embroidery. 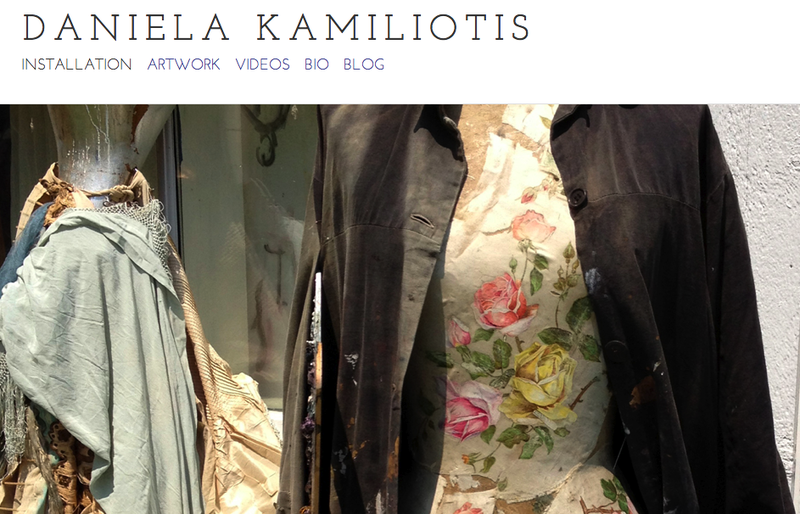 Daniela has a new site. Click here to explore her world.